No 2101432 279897work Guest AccommodationNo. 21 Guest Accommodation was built at the turn of the last century and the interior has been tastefully updated by the present owners with all rooms offering en-suite facilities. There are five letting rooms each with a TV and tea/coffee making facilities. Internet access is available, as well as hairdryers. The five bedrooms each offer something different and the ground floor bedroom has a double and single bed as well as access to a wet room. Bedroom 2 has a king size French bed and the en-suite has a bath with a shower over. Bedroom 3 has an antique double bed with a shower room. Bedroom 4 has two single beds with a larger than average shower room. No. 21 Guest Accommodation is within easy walking distance of the town centre and the local bus and train stations are approximately five – ten minutes walk away. No. 21 Guest Accommodation was built at the turn of the last century and the interior has been tastefully updated by the present owners with all rooms offering en-suite facilities. There are five letting rooms each with a TV and tea/coffee making facilities. Internet access is available, as well as hairdryers. No. 21 Guest Accommodation is conveniently situated for visits to or working at the County and Nuffield Hospitals as well as the Sixth Form College, Herefordshire College of Technology and the Royal National College for the Blind. On the A465 in the heart of the city, on your right as you come in to the city adn on your left as you leave heading north. 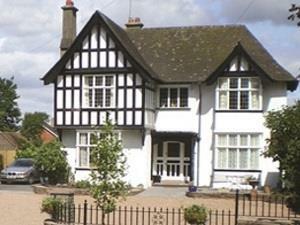 Just 3-5 minutes walk from Hereford Rail Station and the Country Bus Station.